The concept of an authentic “Open Doors” mandate is one that I know each church strives to achieve. Keeping the church on a path that makes our church relevant and continue to thrive in our community is always top of mind at Kingston Road United Church (KRUC). A big part of that is continuing to build one of its most treasured programs – the children’s Sunday School. When I became the Christian Educator two years ago, I took to heart the weight of making sure we stay relevant and strive to grow our numbers in a time when many churches are closing their Sunday School programs. The KRUC Sunday School has, remarkably, been a part of the Kingston Road community for 116 years. That longevity means we have to keep things fresh all the time, because who wants the same lessons each year? Within our congregation almost 50 per cent of our current members were members of our Sunday School or taught Sunday School. Children who became friends decades ago, under the tutelage of our most celebrated members, Bessie Stallworthy, now see each other as adults every Sunday. 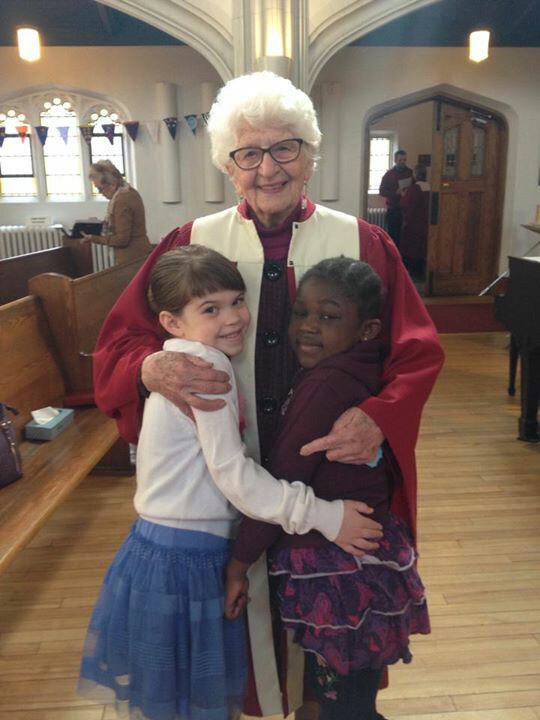 Many of them are now grandparents who bring their grandbabies to our church. Those facts began to buzz around in my brain. We were sitting on an incredible knowledge base. It dawned on me that we had an opportunity to bridge a rather wide gap between two of our favorite generations. Our lively and vibrant senior community, and our children, some of whom are not fortunate enough to have grandparents. So began “Project Grandma”. We have dozens of seniors who have a talent that could be passed along, some of them not even realizing that they had something important or special to teach. After casual conversations with our seniors, a list began to form. We had grandparents who could knit, crochet, cook, garden, pickle, quilt, were finance wizards – the list went on. I sent a call out to the church for donations of aprons so that the children wouldn’t get their Sunday clothes messy while partaking in “Project Grandma”. I was overwhelmed with responses, including one all the way from Abbotsford, B.C. with the inclusion of a favorite cookie recipe. Thank you again, Shirley! With the help of Bessie Stallworthy and Marg Holst, our very first “Project Grandma” – Knitting 101 – was set in place almost exactly a year ago. Marg donated knitting needles and a ball of wool for each child to use and take home. We sent out notices to parents that the children would be knitting with the grandmas and the parents were delighted. We had one of our biggest classes, sitting with Bessie and Marg, learning the basics of casting on and knitting. The kids were enthralled, the grandma’s found their groove – it was moving to watch. Our first class a success, we’ve been building since. We hosted a Mac and Cheese cooking session with Grandma Lee, the children made salads for our annual picnic with Karen Holladay, and planted their own vegetable garden with Brenda Hunter. Those vegetables contributed to the harvest table in the fall. The flower garden in the front was planted with Beth Bolton who had them get their hands dirty and mucky, building a beautiful flower patch. The teens recently had a Teen Finance session with Keith Bolton where Keith spoke to them about the basics of banking, the pitfalls of credit cards, and smart budgeting. With the introduction of Keith to the program, I have now renamed it “Project Grandparent”. Eventually, we are going to launch an initiative called “Adopt a Grandparent”. Many of the congregation have approached me to say how sad they are that the art of writing letters and thank you cards seems to be dying out. Taking that to heart, we thought it would be worthwhile to begin pairing up children with older members of our congregation to start a pen pal program. This gives each child an opportunity to practice their handwriting skills while they write a little letter, address the envelope, put a stamp on it and walk it over to the mailbox and send it off. It may only travel a couple of blocks, but that simple process not only makes it exciting for the children, but our grandparents will receive a letter once a week that they can then respond to and mail back to the children. I’m excited for our future. I’m excited for our children’s future. The past year has proven over and over again that we are all valuable; we all have so much to contribute. It’s an exciting time for us at Kingston Road United Church and I welcome you to stop by and see the church in action. Bessie, I met your grandson in Starbucks today in Victoria and he told me about you. I am amazed and would like to read one of your books or something on your life story. I am 70 and cannot do half the things you are doing on the internet and I am sure not as active although I do have the same interest in helping those less fortunate than I as my husband an I go to Uganda and volunteer in an Aids/TB clinic for Adults on treatment for Ads. and also work with Children and adolescent who were born with AIDS and are now on treatment and will be for the rest of their lives. I travel and volunteer with an 87 year old woman called Hilda who also has a strong spiritual background and she makes the 36 hour treck to Uganda each year to work in the Clinic we support both with volunteers going each year from Victoria and also financially as we have yearly fundraisers here in Victoria. Your story will be an inspiration to Hilda. Our website is http://www.mengofriends.ca but at this time we cannot retrieve messages left on that website. Hope you will email me back as to how to find your books. Martha Menzies with much admiration.